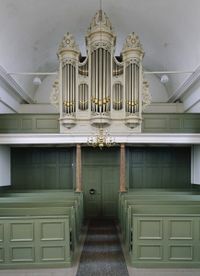 Interior and organ in the Doopsgezinde Kerk, IJlst. Photo by Paul van Galen and Kris Roderburg. IJlst, one of the eleven towns (coordinates: 53.01136, 5.62059 [53° 0′ 40″ N, 5° 37′ 14″ E]; 1947 pop. 1,488, with 154 Mennonites; 2005 pop. 18,000) of the Dutch province of Friesland, the seat of a Mennonite congregation with a rich history dating back to the early days. Richt Heynes, of IJlst, sealed her faith with her martyr's death by drowning at Leeuwarden in 1547. In 1551-1557 Leenaert Bouwens baptized 49 persons here. Nothing more is known about this church in the 16th century except that there were two congregations. One of them, apparently of the Waterlander branch, joined the Sociëteit of Friesland at its founding in 1695; it had about 35 self-supporting members. This congregation had a church record book listing the baptized members which was begun in 1701. It acquired a new meetinghouse, dedicated on 12 August 1708, by its (lay) preacher Sybren Gosses. The other congregation, always small, was a member of the Groningen Old Flemish Sociëteit in 1710 and probably much earlier. It dates back at least to 1648, when Louwe Mantjes was its preacher, and it was still sending delegates to the Sociëteit in 1815, when the conference was dissolved. In 1746 at least 15 members of the IJlst Old Flemish congregation were living in Sneek. These members organized an independent congregation under the leadership of Wouter Berends. The Waterlander congregation at IJlst was served by Jelle Sipkes van Teerns 1771-1818. He was an active Patriot and a man of importance not only in his home congregation, taking an active political part in the government of Friesland in 1796-1798. In 1819 the two congregations in IJlst merged; they had a total of 102 members. The old Mennonite principle of charitable giving was expressed in the "Ten Kate Foundation," which was established by the brothers Rijkle (1770-1855) and Keimpe (1775-1856) Lammerts ten Kate for the support of the poor. A new meetinghouse was dedicated on 27 September 1857. A pipe organ was installed in 1881. Until 1818 the congregation was served by lay ministers. H. J. Busé, minister at IJlst 1890-1917, wrote a history of the congregation (manuscript). Busé was followed by L. G. Holtz 1918-1921, B. H. Rudolphi 1921-1930, B. Dufour 1930-1935, A. du Croix 1936-1939, Miss J. H. van der Slooten 1939-1946, H. B. Kossen 1950-1956. 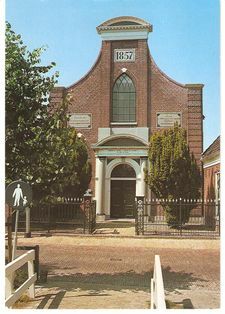 The pulpit was vacant in 1957; the pastor of the nearby Sneek congregation had charge of the IJlst congregation. The church had a ladies' circle and a choir. Busé, H. J. Ter gedachtenis aan het 50-jarig bestaan der nieuwe Doopsgezinde Kerk te IJlst. Sneek, n.d.-1907. Cate, Steven Blaupot ten. Geschiedenis der Doopsgezinden in Friesland. Leeuwarden: W. Eekhoff, 1839: Passim, see Index. Doopsgezinde Bijdragen (1861): 145; (1879) 3, 89; (1890): 93-98; (1892) 89-98; (1917) 66-73. Gorter, D. S. (Douwe Simons). Doopsgezinde lektuur tot bevordering van christelijke kennis en godzaligheid. Sneek: Van Druten & Bleeker, 1858. Hege, Christian and Christian Neff. Mennonitisches Lexikon, 4 vols. Frankfurt & Weierhof: Hege; Karlsruhe: Schneider, 1913-1967: v. II, 406. Hoop Scheffer, Jacob Gijsbert de. Inventaris der Archiefstukken berustende bij de Vereenigde Doopsgezinde Gemeente to Amsterdam, 2 vols. Amsterdam: Uitgegeven en ten geschenke aangeboden door den Kerkeraad dier Gemeente, 1883-1884: II, Nos. 2361-2363. Naamlijst der tegenwoordig in dienst zijnde predikanten der Mennoniten in de vereenigde Nederlanden (1829): 49 f.
Reliwiki. "IJlst, Eegracht 28-29 - Doopsgezinde Kerk." 16 April 2013. Web. 13 October 2014. http://reliwiki.nl/index.php/IJlst,_Eegracht_28-29_-_Doopsgezinde_Kerk. Zijpp, Nanne van der. "IJlst (Friesland, Netherlands)." Global Anabaptist Mennonite Encyclopedia Online. 1959. Web. 24 Apr 2019. http://gameo.org/index.php?title=IJlst_(Friesland,_Netherlands)&oldid=144163. Zijpp, Nanne van der. (1959). IJlst (Friesland, Netherlands). Global Anabaptist Mennonite Encyclopedia Online. Retrieved 24 April 2019, from http://gameo.org/index.php?title=IJlst_(Friesland,_Netherlands)&oldid=144163. Adapted by permission of Herald Press, Harrisonburg, Virginia, from Mennonite Encyclopedia, Vol. 3, p. 4. All rights reserved.